Is your household at risk? Be safe this winter. 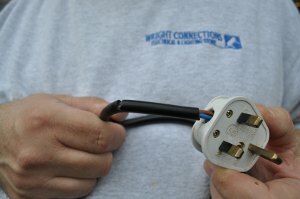 Colin Wright who with his wife Hazel runs Wright Connections, issued the warning following the end of British Summer Time when greater reliance is placed on electrical appliances and lamps, in particular portable and handheld ones. To prevent accidents this winter Colin has compiled some simple advice in order to avoid fires, electrical shocks and other accidents. Make sure it isn’t trapped under furniture. Is it correctly secured by the outer insulation where it goes into the plug? The interior wiring should not be visible. Are there any nicks or cuts affecting the outer insulation? Does the plug have any cracks in it? Does the plug have the correctly rated fuse for the flex and appliance? Make sure that extension leads are also correctly fused and fully uncoiled when in use, especially if you are running an electric heater. Make sure that it doesn’t become a trip hazard by routing it around rather than across a thoroughfare. Lighting needs to be checked as well. Is the lighting adequate for the area to be lit? Is the lamp (bulb) correctly rated for the fitting or shade? Colin added: “If anyone has any doubts or concerns then I would be happy to give free advice over the telephone. I would much rather do that than think that there might be an accident which could have been prevented but for the sake of a simple call”.